The 2018 Atlantic hurricane season produced 13 named storms as of October 5, including 6 hurricanes. The most recent of these storms that made landfall in the United States were Tropical Storm Gordon and Hurricane Florence. Gordon entered the Gulf of Mexico on September 3, triggering the first shut-in oil and natural gas production of the 2018 season. Hurricane Florence struck the East Coast on September 14 and had no impact on Gulf of Mexico production. The effect that a storm has on crude oil and natural gas production depends, in part, on the infrastructure in its path. 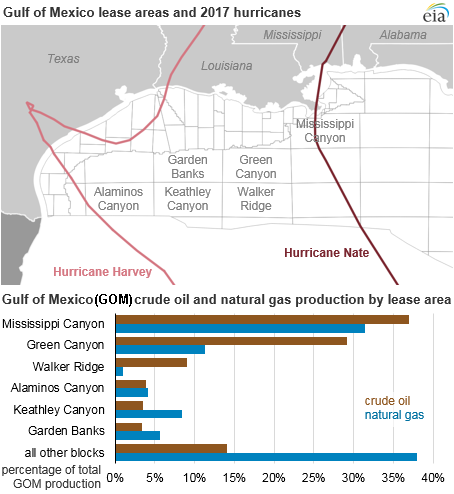 In 2017, Category 1 Hurricane Nate passed through the high-producing Mississippi Canyon lease area in the Gulf of Mexico, resulting in a larger disruption to production than Hurricane Harvey, a Category 4 storm that, although stronger, did not pass through major offshore production areas. In 2018, Hurricane Florence, like Hurricanes Irma and Maria in 2017, was a catastrophic storm that did not have any significant effect on oil and natural gas production because of its location and trajectory. As the 2018 hurricane season progresses, shut-in oil and natural gas production will continue to depend largely on the trajectory as well as the severity of storms. 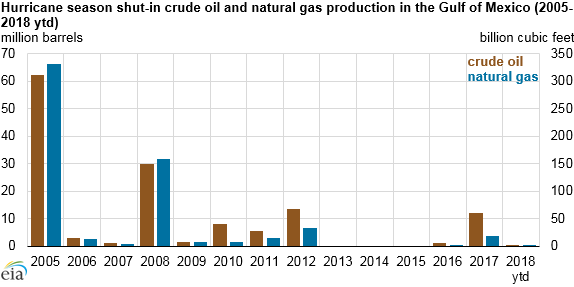 Of the 17 named storms in the 2017 hurricane season, Hurricane Harvey and Hurricane Nate had the largest effect on oil and natural gas production, reducing production in the Gulf of Mexico by a cumulative 12 million barrels of crude oil and 18 billion cubic feet (Bcf) of natural gas, the first significant disruption of oil and natural gas production since Hurricane Isaac shut in 13.5 million barrels of crude oil and 32 Bcf of natural gas in 2012. Previous disruptions in 2005 and 2008, caused by Hurricanes Katrina, Rita, Ike, and Gustav, had even larger impacts on Gulf of Mexico production. In the Gulf of Mexico, 66% of crude oil and 42% of natural gas production comes from wells in the Mississippi Canyon and Green Canyon lease areas, both located southeast of Louisiana. A storm passing through these high-producing areas can have a large effect on total offshore production. Storms that make landfall and damage onshore infrastructure, such as storage facilities and gathering lines, can have a longer-lasting effect on production than storms that only affect a producing area. Hurricane Harvey, the first major hurricane to make landfall in the United States since 2005, was a Category 4 storm when it made landfall in Texas. Harvey passed through the corner of the Alaminos Canyon offshore production area and shut-in an average of 0.2 million barrels per day (b/d) of crude oil production and 0.5 Bcf/d of natural gas production. During 13 days in late August, Harvey’s cumulative production effect was the loss of 3.0 million barrels of crude oil and 6.6 Bcf of natural gas, or 6% and 7% of total August Gulf of Mexico crude oil and natural gas production, respectively. Key pipelines and distribution systems to refineries and ports in the region were also shut down, increasing the time it took for production to recover from the storm. Hurricane Nate reached Category 1 status as it passed through the Mississippi Canyon offshore production area and made landfall at the mouth of the Mississippi River. Hurricane Nate reduced production by an average of 0.8 million b/d of crude oil and 1.2 Bcf/d of natural gas during 10 days in early October. Overall, Hurricane Nate caused a cumulative production loss of 8.4 million barrels of crude oil and 11.8 Bcf of natural gas, or 18% and 15% of total October Gulf of Mexico crude oil and natural gas production, respectively. 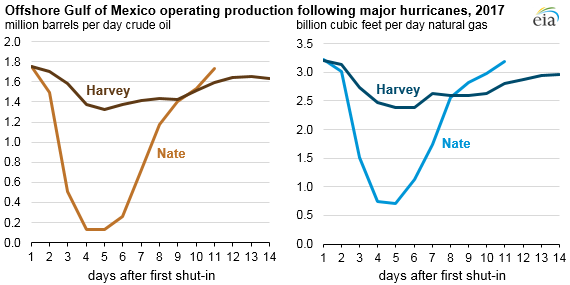 Although Hurricane Harvey was the stronger of the two hurricanes, the trajectory of Hurricane Nate proved more disruptive to offshore production because it went through the highest-producing lease area in the Gulf of Mexico.